In his book “Man with a Blue Scarf: On Sitting for a Portrait by Lucian Freud”, Martin Gayford reports that Neil MacGregor, when director of the National Gallery, “often met Lucian Freud wandering around there in the evening, and learned a lot from him because he sees as an artist. This is quite different from the angle of an art historian.” Unfortunately, there is one lesson that Mr MacGregor might appear not to have learnt from Lucian Freud. Anyone who possesses a particular couple of books can gauge the error of the National Gallery’s picture cleanings and “restorations”. In 1938 the gallery’s then director, Kenneth Clark, published a fine book of black and white photographs of details from pictures in the gallery (“One Hundred DETAILS from Pictures in the National Gallery”). Those photographs were of very high quality and had been taken for scientific rather than aesthetic purposes. In 1990, the gallery re-published Clark’s book but, this time, with recent colour photographs. In a foreword to the new edition, Neil Macgregor wrote that in 1938 the National Gallery’s pictures were “among the dirtiest in the world”. (There is surely a study to be made of the almost pathological disposition of those commentators who equate evidence of aged materials in pictures with dirt.) MacGregor acknowledges that while Clark complains in some of his commentaries of pleasure lost as a result of the interposition of “discoloured varnish or […] clumsy retouchings”, he remained fearful of “what might be found if the golden veils of dirt and varnish were ever to be removed.” Clark had good reason to be fearful: his then recent cleaning of Velazquez’s full length portrait of Philip IV of Spain (the “Silver Philip”) had – rightly – unleashed a firestorm of criticism and controversy. Mr MacGregor acknowledges that following the wholesale cleanings that took place at the gallery after the Second World War, many pictures were now “different in critical respects” from the paintings about which Clark had written. It might be tempting to take the phrase “different in critical respects” as a MacGregor-esque euphemism for Freud’s “completely fucked-up”, given that he acknowledged that readers possessing both editions of the book “will decide how much is gain, how much loss” as a result of those cleanings. Alas, from that point onwards, Mr MacGregor seems to have lashed himself to the mast of the Good Ship Conservation and kept private any reservations that he might have had about picture restorations. 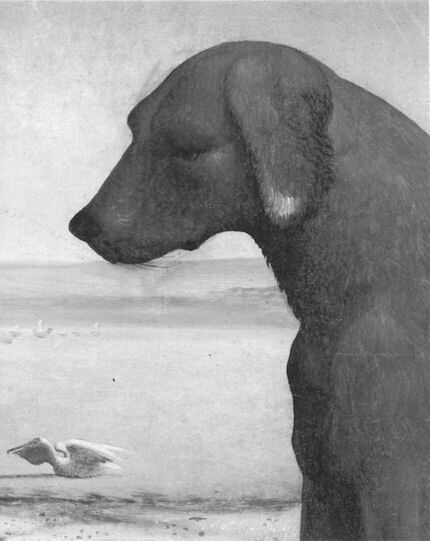 To appreciate the changes wrought on that hound and a nearby pelican, see Figs. 1 to 6, right. The colour photographs published in the 1990 edition are here shown in greyscale so that like may be compared with like for the purposes of easier and more revealing comparisons. 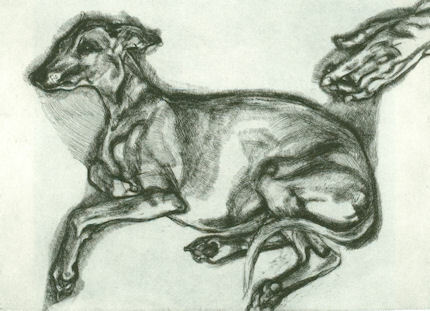 I am told that on the blogosphere, I am yet again misquoted as saying that Lucian Freud couldn’t “compose” a picture for toffee. I am no more interested than was Lucian in rearranging objects to make art. What I actually said to the late Bruce Bernard over a bibulous Soho lunch for the Sunday Times colour supplement some twenty years ago was that Lucian couldn’t “design” a painting for toffee. We were talking only of his great late nudes. By contrast, an early head like the John Minton could hang next to Van der Weyden, with its delicate surface and clarity of design. When Bill Coldstream, Lucian’s contemporary and equal, made a paint mark in response to appearance it was related immediately to every other mark on the surface, leading the eye from edge to edge of the picture; that is, drawing as design. Lucian’s brush marks were related directly only to others within the particular object of his scrutiny. As Bruce Bernard went on to quote me: no one else could paint so intensely and so powerfully within the figure. Never the less I was wrong. Lucian, as Martin Gayford records in his book the “Man with a Blue Scarf”, always worked standing up so that he could dart backwards and forwards from his easel to subject particular objects to closer observation. In the grandest of the late images, different areas of the painting would be created from different viewpoints, different angles, different distances. These areas seem to crash in to each other, along surface fault lines that I at least find visually exhilarating. Whether this is design or anti-design matters not, it is brilliant and original. 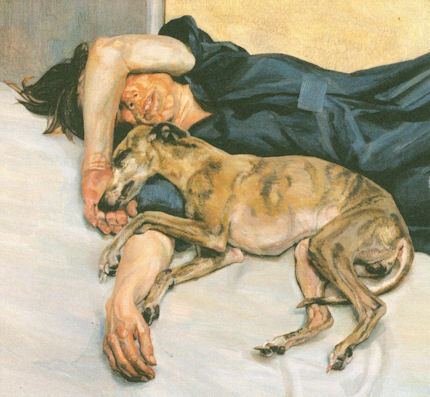 I have been asked to compare Lucian Freud’s approach to painting a Royal Portrait with my own. When I was commissioned to paint the Royal Family I virtually lived in the Palace for a year, trundling my easels and materials, Spencer-like, from the “artist studio” right round to the White Stateroom where Lavery had made his equally large 1913 painting, of George V and family. I drew and redrew the room as the central subject of my design, only occasionally meeting my Royal sitters, about seven hours with each, on different sittings, allowing their figures to grow from and into my design. In Martin’s book we see Lucian standing some two metres from the Queen with a tiny canvas on a simple radial easel. He had the courage to deal with even so eminent a figure just as he dealt with every other human being: to quote his own words, “zoologically”. Asked what his Royal sitter had thought of John Wonnacott, I regret to pass on the disappointingly minimal – – – – “scruffy”! John Wonnacott’s magnificent portrait group of the Royal Family is in the collection of the National Portrait Gallery, where, since the arrival from the Tate of Sandy Nairne, as director, it has been consigned to the reserve collection. It can, however, be viewed on request. Above, Fig. 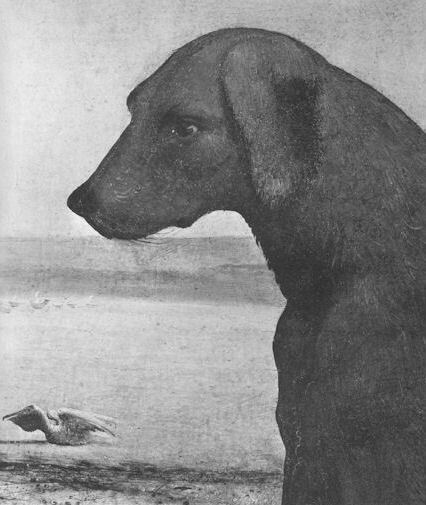 1: A Dog from “The Death of Procris” (NG 698) by Piero di Cosimo, painted by about 1500, as published and described in Kenneth Clark’s 1938 “One Hundred DETAILS from Pictures in the National Gallery”, and as recorded before cleaning. Above, Fig. 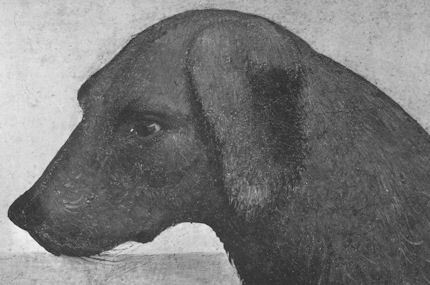 2: A dog from “A Mythological Subject” by Piero di Cosimo, painted about 1500, as published and described in the 1990 edition of Kenneth Clark’s book, and as seen after cleaning. Above, Fig. 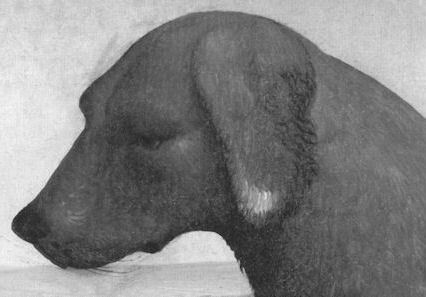 3: A detail from Fig. 1, as before cleaning. Above, Fig. 4: A detail from Fig. 2, as after cleaning. Above, Fig. 5: A detail from Fig. 1, before cleaning. Above, Fig. 6: A detail from Fig. 2, after cleaning. What might explain the manifest differences between the sequence of before-cleaning and after-cleaning photographs shown above? If the restorers had merely removed dirt and discoloured varnishes (and some earlier restorers’ retouchings), we would expect to find an enhanced, not a diminished, range of tone values. That is because, old yellowed varnishes simultaneously darken light values and lighten dark ones. Why then, in all of the above photographs do we see the opposite: individually reduced values and compressed, not extended, ranges of value. What is so striking to any student of National Gallery restorations is the consistency of this thwarting of reasonable optical expectations. Almost no picture – not even Titian’s great “Bacchus and Ariadne” shown below – escapes injury. There are other ways of calculating injuries. 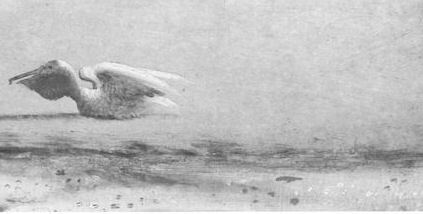 You might play “Spot the Changes” – and begin by counting the dark feathers on the bottom edge of the pelican’s near wing. By identifying the lost feathers, we simultaneously identify the injuries to the artist’s drawing and design. Defenders of rotten restorations sometimes claim that published photographs are misleading. The two Titian details below are not taken from books but from hard copies of the National Gallery’s own photographic records. They tell the same story, record the same losses. Above, Fig. 7: A detail from Titian’s “Bacchus and Ariadne” before its cleaning began at the National Gallery in 1967. On May 11th that year the Duke of Wellington congratulated the gallery’s director, Sir Philip Hendy, on his “courageous decision” to clean the picture. Above, Fig. 8: The detail shown in Fig. 7, after its cleaning, about which the restorer, Arthur Lucas, boasted “there’s more of me than Titian in that sky“. Above, Fig. 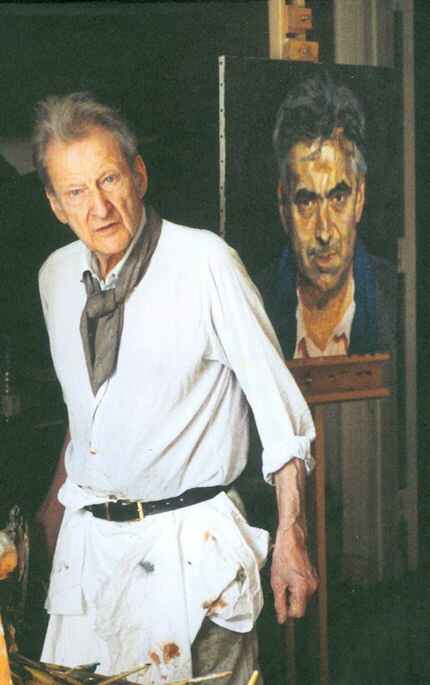 10: a photograph (detail) by David Dawson of Lucian Freud and Martin Gayford in the artist’s studio, from the sitter’s book “Man with a Blue Scarf”, published by Thames and Hudson, 2010. Below, Figs. 10 and 11: David Dawson’s photographs of Lucian Freud’s etching “Pluto Aged Twelve”, 2000, and his painting “Double Portrait”, 1985-86. This entry was posted on July 24, 2011. It was filed under blog and was tagged with John Wonnacott, Kenneth Clark, Lucian Freud, Neil MacGregor, Picture restorations, Piero di Cosimo, Sir Philip Hendy, The National Gallery, Titian's Bacchus and Ariadne.